Your trip to Bali comes to an end? It is time to do the last shopping, whether for your loved ones or for you. Here is our shopping selection to bring home a small piece of Paradise Island once back. Batik, Songket, Prada, Endek, etc. Bali is well known for the excellence and richness of its fabrics. You can bring typical outfits with very varied cuts, textures and colors. You can also discover the different weaving methods used in some shops. If you are in the Seminyak area, take the opportunity to go at Nyaman Boutique, you could find clothes 100% made in Bali. Traditionally, wood carving in Bali was intended to decorated temples or palaces. The artists found their inspiration in Hindu and also in the daily life of Balinese. The village of Mas, near Ubud, specializes in woodworking. In Bali, there are many markets or street stalls where you can find these colorful giveaways. One of the most famous places is Geneva handicraft in Kerobokan. Here, you could find natural handicraft made with glass, bamboo, coconut and several other materials. Balinese cuisine is very colorful, spicy and tasty. Pepper is the leading product of Balinese cuisine. There are 7 varieties, from bird pepper, the most powerful and the smallest, to Lombok cab, long red pepper very sweet. Nutmeg, clove, citronella, ginger, cardamom, you will find all you could wish for on the Ubud market. Bali is an artist’s Island. There are many Art Galleries. One of them is Nyaman Gallery, a contemporary art gallery based in Seminyak. 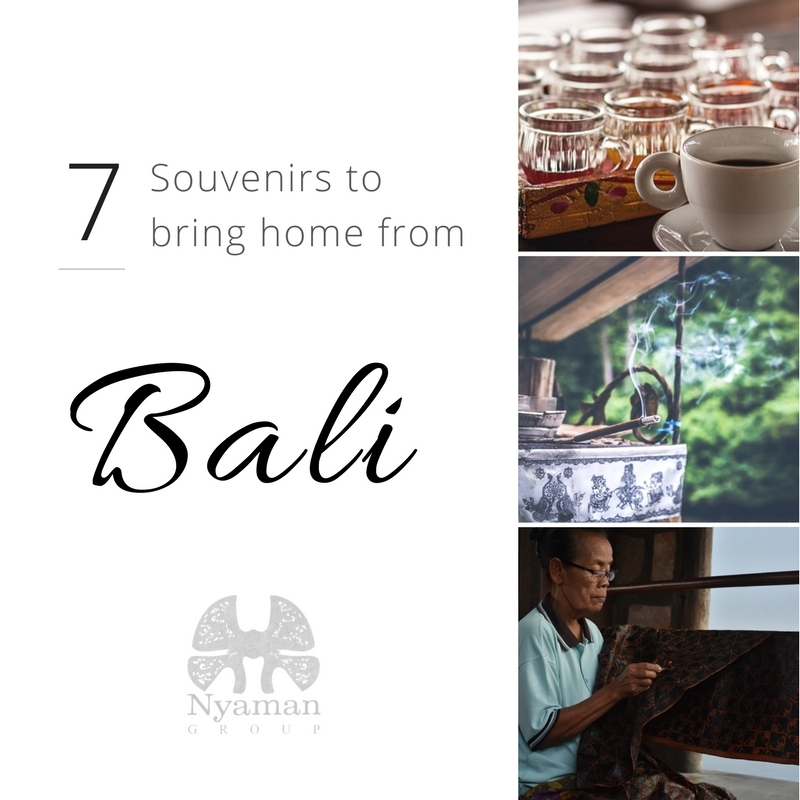 You will spoil yourself bringing back the Balinese art with you. Kopi Luwak is a precious coffee made from part-digested coffee cherries eaten by the Asian palm civet. For coffee lovers, Luwak coffee is much appreciated. The women from Bali have learned how to use what nature has offered them to take care of their skin and their hair, weakened by the water and the sun. Coconut, exotic fruits, pink or white frangipani flowers are found everywhere, from which the Balinese extract sublime oil that you can apply on your body, your face and your hair to moisturize and scrub. The smell will make you feel like you’ve never left this Paradise Island! There are many things that make Bali an unforgettable island. To know more about our services and inquires us for a customize luxury travel experience in Indonesia, contact us directly at: marketingnyamangroup@gmail.com or click here.